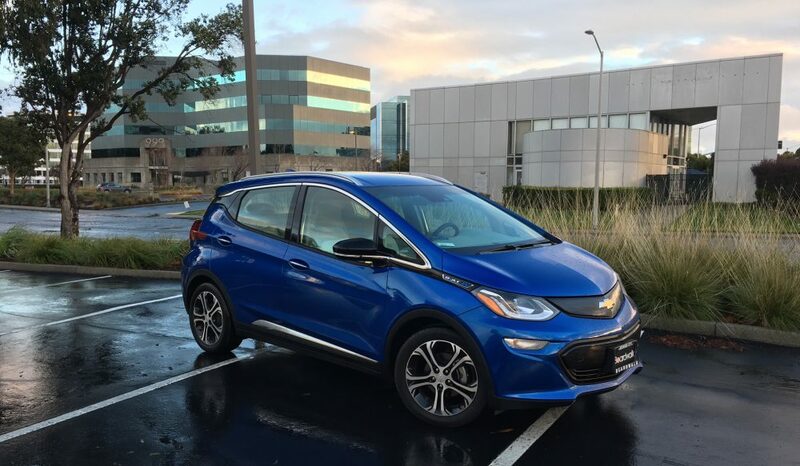 Today, I’ve had my Chevrolet Bolt EV for six months! Here’s what it’s been like living with an all-electric car with few limitations. With a 10,000-miles-a-year lease, I’ve been careful to not drive my car every day. The odometer stands at 5,113 today, halfway through the year, so I think I’m in good shape. Note: The 201-mile range shown below reflects my trip home from work after charging, so it’s not at the 225 that it was when I started out. During this time, I’ve tested a number of other electric and hybrid cars, which you can see by going to Clean Fleet Report. I have more on the way, including the latest VW e-Golf and BMW i3, both of which have greater ranges (but are still not in the Bolt’s territory). I recently had a chance to interview Brett Hinds, Ford’s Chief Engineer for electrified powertrain Systems. It was connected with a screening of the new film, The Third Industrial Revolution, about what we need to do over the next two generations (and on) to help preserve life on Earth from climate change. It’s based on a 2011 book by Jeremy Rifkin. I proudly presented Brett with my card, with a photo of my Bolt on it. Regarding electrical range, in the cold early months of 2017, I was getting 205, maybe 210 miles on the range meter for a full charge. I was a little disappointed. Now, however, I consistently see 230 or 240 miles, or around 4.0 miles per kWh. And, I’ve noticed that the estimates the car gives me are pretty close to real-world. Of course, I drive conservatively (it’s the only thing I do that way). I don’t stomp on the accelerator (don’t call it “the gas”) and I use the Low (L) setting all the time, with strong regeneration, so much of my braking happens without the brake pedal. “One pedal driving” is a real thing with an all-electric car, and it’s great fun when commuting. You can place yourself exactly into the available space without any braking at all. It’s a skill–perhaps even an art. The car certainly looks the same. No significant wear and tear to the outside that I can tell. I did pick up a chip in the windshield quite early, but with a quick fix at Safelite it hasn’t become more than an occasional sparkle in the corner of my eye when the sun shines a certain direction. Inside, the floormats are no longer pristine, and the rear cargo area has proven to be easily marked by amplifiers and guitar cases. I use a little pad I made out of a workout mat if I feel like lugging it from my downstairs office. But the rear hatch is easy to access for musical instruments and various stuff. The gossamer-thin rear cargo shield works great for hiding my “trunk” but comes off in a flash and takes up virtually no space. The rear seats fold down easily, and when they are in place, hold adult passengers comfortably. My Bolt has passed the granddaughters test. Before I ordered it, I needed to be sure I’d be able to drive 85 miles to my granddaughters’ house and back. When I’ve done so, I’ve returned with 40 to 50 miles left to spare! I drove my car to the Western Automotive Journalists annual Media Days event in April in Monterey–about 100 miles away. I was able to use one of their generator trucks to fill up for the trip back. I didn’t need to visit any charging stations there or along the way. The only negatives I’ve had are electrical and intermittent. A few times, the audio display has simply refused to come on when I start the car. I found that turning the car off and back on (sometimes a few times) has cleared this. I’ve heard through the grapevine that there’s a software fix for this issue in early Bolts, but I haven’t had time to swing by my local dealership. They, on the other hand, have sent me multiple offers for service (that I don’t need)–including an oil change! Also, it sometimes takes three pushes to lock all the doors. I joined the Chevy Bolt EV Owners Group on Facebook. I was one of the first members–there are now more than three thousand! There’s a local San Francisco Bay Area page and a Chevy Bolt Interest group too, but they have a lot fewer members. We share the joy of getting our cars and discussing the various pleasures and occasional issues. I see Bolts on the road fairly frequently. Yesterday, I was following one on the way home and snapped this shot. I flashed my lights, but the young woman driving it didn’t respond. One of the most interesting things for me is that as I drive and enjoy the Bolt, I’m finding that I no longer feel like a journalist with it–I feel like an owner! And that’s a very different experience. Driving test cars weekly can be exciting and interesting, but it’s like living in a hotel. When I’m in my Bolt, I’m at home, and I feel like it’s a step into the future. I ordered a ChargePoint level 2 home charger when I first got the car, but I haven’t installed it in my garage yet! Besides being an expensive job (I’ve been quoted many hundreds of dollars to install the $500 charger), I don’t really need it. I normally fill up at one of the dozen chargers at work, and if I need to top it off, it’ll give me about 50 miles overnight at home on household current. Like every electric car, to varying degrees of course, the Bolt is quick off the line, and although it’s tall, it stays level on turns and has a supple suspension. Although I’d love to have a manual transmission, none are available–or needed–with an EV. I still love my choice of Kinetic Blue, but I’ve seen the other colors and they all have their charms. The white is actually quite nice on the car, and the bright orange really makes a statement. I chose the light gray interior with white accents–in the top-level Premier with every option–so it feels very pleasant inside. The leather is wearing well, but, like the rest of the interior, is good but not at the exquisite level of, say, an Audi. For nearly $44,000 (minus fed, state, and PG&E rebates), it doesn’t feel like a luxury car. But the smooth, silent running is a joy, and the premium Bose audio system is very capable. I’m excited about finally receiving my carpool lane stickers! Now, as an EV driver, I can use the carpool lane with a single occupant–and save half price on my bridge toll! Yesterday, this saved me perhaps 20 minutes on my commute to work, and the cheaper toll is always welcome. One annoyance is the small, short sunvisors that do not slide back to cover the side window. You can get blinded when the sun is to your left. I also am surprised that there isn’t adaptive cruise control, although I wouldn’t use it much. For the National Drive Electric Week (September 9-16 this year), I will be participating in a local event, where I can show my car and give test rides. I’m also hoping to put together something at my office, where we EV enthusiasts number more than two dozen. One real surprise for me is the lack of attention I get driving my Bolt. Nobody seems to notice that I’m in a multiple-award-winning, brand-new car. I think that Chevrolet intentionally went with mainstream styling, although it is certainly up-to-date. Perhaps folks think it’s another compact hatchback, such as the gas-powered Honda Fit. But I was hoping for more, since I love to talk about my car. I’m looking forward to two-and-a-half more years of Bolt driving, but with a lease, I’ll be ready to trade it in for one of the many new BEVs that are coming from Audi, VW, Volvo, Ford, Jaguar, MINI, Nissan, and other brands. Or I may just keep it!